I married Sally in 1971 and the following year I started at the Foreign and Commonwealth Office, Hanslope Park, in the security department, for seven years joining the Thames Valley Police on the 8th October 1979, at the age of 27 years. 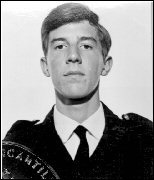 After my initial training at the National Police Training Centre, Eynsham Hall and the Force Training Centre at Sulhamstead, I was posted to Newport Pagnell on the 22nd December 1979, where I spent just over one year of my service. I then moved to Wolverton where I worked on shift, and also as the Area Beat Officer for Wolverton, New Bradwell and Greenleys, being posted there on a permanent basis on the 1st January 1983. Remaining as an Area Beat Officer for a further year, I then went back onto a shift, working from Wolverton Police Station until the new Divisional Police Headquarters opened at Central Milton Keynes. 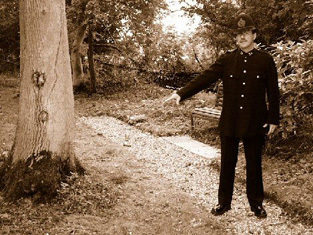 I spent some time policing the miners’ strike during 1984/1985. On the 18th February1985 I, along with most other police officers and civilian staff on the Division, moved to the new station. Still on the same shift I covered the Wolverton Area, driving one of the area cars. On the 8th September 1986, having been injured during an incident, I went into the control room for a temporary period, which lasted just over eight months. I then moved back to Wolverton, on the 1st June1987, as the Area Beat Officer for Hanslope, Castlethorpe, Haversham and Little Linford. In early 1999 I was transferred to Newport Pagnell when the new Milton Keynes Rural Sector was created, still as Area Beat Officer for the Hanslope area I remained on this Beat for 17 years before being posted back to Central Milton Keynes where I was put in charge of the new Mobile CCTV Units. I remained in this position until retiring on the 31st January 2011 During my service I received two Chief Constable’s Commendations and wrote two books one is called "Over 100 years of Hanslope and Castlethorpe Village Policemen" the other is called "Over 100 Years of Bradwell/Stantonbury Police Constables". 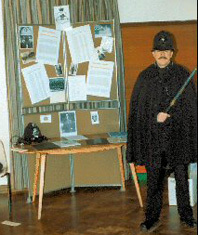 I became interested in the Bucks Constabulary and Police History in general during 1994 when at the local school they were having a display on the formation of the Hanslope parish Council in 1894, as Area Beat Officer of Hanslope, I was asked if I could assist with a small display on the police 1894 and and dress as a constable of that time. I was also asked who would have been the village constable 1894. I wrote to the Records Office at Aylesbury and they informed me that the officer’s name was PC 42 Joseph Lorton. I was amazed at the information on him they were able to supply even the colour of his eyes. So I decided to research all the village constables since the formation of the Bucks Constabulary back in 1857. I found that I was the 39th constable. From there I got hooked and started my research which at this point in time I have around 2,000 photographs and around the same number of full or part records of service of police officers who served in the Bucks Constabulary up until the amalgamation in 1968 forming the Thames Valley Constabulary now called Thames Valley Police.